Frozen ground also hosts an unusual family of substances known as clathrate or gas hydrates. These consist of gases trapped in a crystalline "shell" or "cage" of ice. 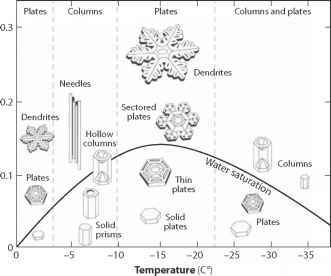 The ice crystals are connected via customary hydrogen bonds (see chapter 2), but the pressure of the gas molecules inside the shell prevents them from collapsing into a standard ice crystal lattice. Gas hydrates are only stable under a specialized, sometimes narrow, range of temperature and pressure conditions. Most common are methane (natural gas) hydrates. These are particularly common in shallow continental shelf environments. Large deposits of methane hydrate have been mapped on the seafloor, in continental-shelf sediments of the Arctic basin, and in terrestrial permafrost, of great interest for their potential as hydrocarbon energy sources. Many other gases are also found in hydrates, including C02. The release of CH4 or C02 to the atmosphere through destabilization of gas hydrates as ocean temperatures warm is a potential "wild card" in the climate system, capable of producing abrupt climate change if large quantities of methane hydrate were to melt. It is not clear how much of a threat this is, as seafloor methane is likely to be oxidized as it passes through the ocean water column, and the different reservoirs of methane hydrate are unlikely to destabilize simultaneously.